Joseph Mordelet is a big photographer of distant mountains from the region of , Provence (France). It has often portrayed the Canigó massif from various points, especially from a privileged site, the Astronomical Observatory of Mont Chiran, where sometimes he works in certain occasions. 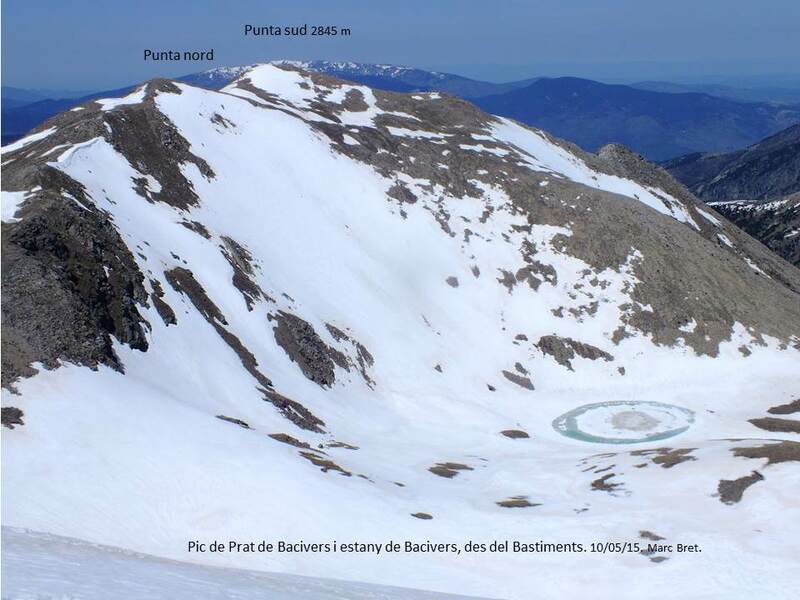 However he thought about the challenge of portraying the Pyrenees from other more distant point, some mountain in the Alps and he choise the Puy de la Seche (2820 m), the same summit which had been portrayed by us last July from Canigó. Joseph thought, like in other occasions when he has made phenomenal images, that the best way to realize was to consider the best instant of the Sun on its way. He was able to determine the precise day and hour of that event and then he planned the climb with a companion, F.Besombes. Last winter they reached the top of the mountain at the right time and not only got to photograph the Canigó massif but also other peak: The Prat de Bacivers (or Prat de Bassibés in French) 2845 m high. Surprising aspect, with a mirror image on itself due to a intense atmospheric refraction and a cold mirage!. And a extreme distance, 401 Km!. That peak has two summits like we can see in this other taken of closer. The remote photo of Joseph also show the same points. However, considering the high refractive index of that day It even seems that was photographed another mountain also even still more distant! 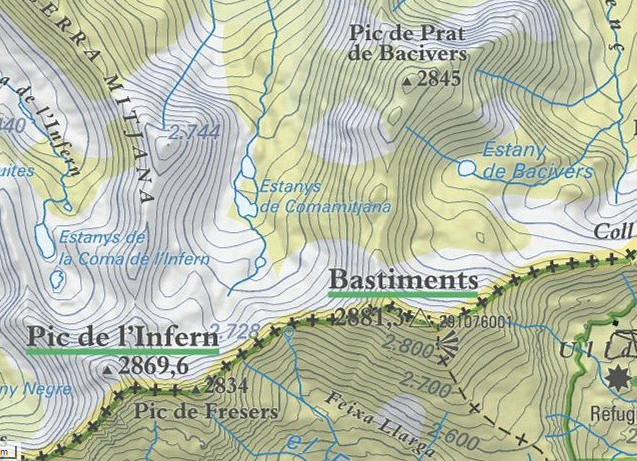 : The Pic de l’Infern (or l’Enfer) (403 Km in this case!). The line of sight it’s possible with the degree of refraction which appears to be in the picture. We can see a profile of this perspective more down. That ultradistant peak it’s located on the border with the neighboring state and it reach almost 2870 meters high above the sea. Moreover you can also to see the coincidence of positions in the panorama of Ulrich Deuschle simulator after applying a high refractive index. Here a comparative ilustration easier to compare. Furthermore, it can be considered that the Pic de l’Infern is actually more pointed as the graphical appearance, and therefore more similar to the picture. In any case (one or two summits) this has meant covering a distance of over 400 km !, because at least one of them I think almost not in doubt. Then I attached the description of the adventure written by the author of the photographs. It was for me the first time I chaussais spikes … is effective this stuff! We finally just on time! -2 ° C, it is rather hot for an altitude of 2820m at 17h a January 5? Canigou is here !!!!! at 380km, and another mountain which I do not know yet? We’ll have to go down and analyze images. Now finished joke have to go down, the night arrived. The spikes in part goes well, surprisingly. Then an error on the last part … we find ourselves on a “robine” (land slope / black marl and steep) stuck between two cliffs, one above and one below! 1:30 galley, turning to look for a possible switch to move on the roads without chamois whether we were on the right side! Finally much lower, we find traces of our go! the path is here! Still 1h30mn walking and we’re back to the car. Back home at 0:30, it took us 6 hours to go up and down for 5 hours. But against all odds the picture is done! had read it a few years ago that we could not see more than 400km ??? !!! I’m sure now that this is wrong! Ilustrated by Joseph, on the google earth map. The Gulf of Lions is crucial to save this great distance. 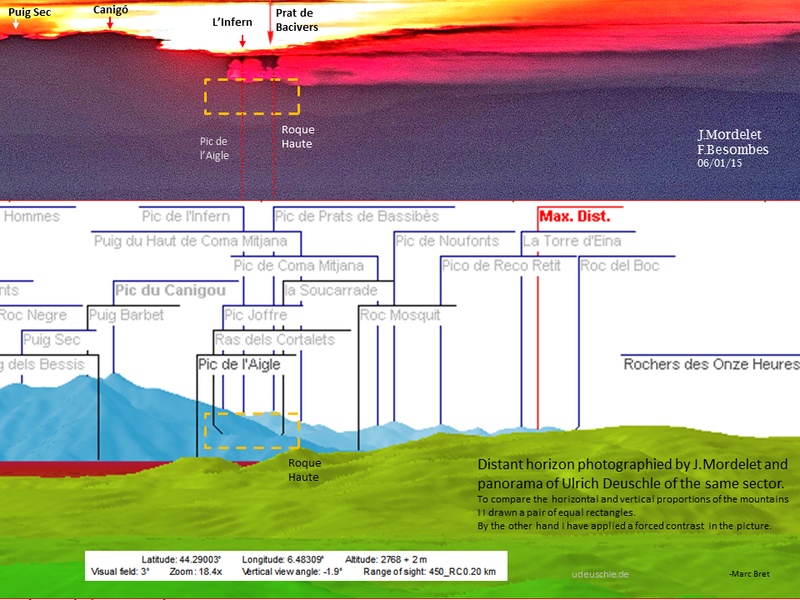 Ilustration with a view profile, in this case reaching the Pic de l’infern (or l’Enfer also, in french) that I generated from the simulator heywhatsthat. You can click for enlarge. 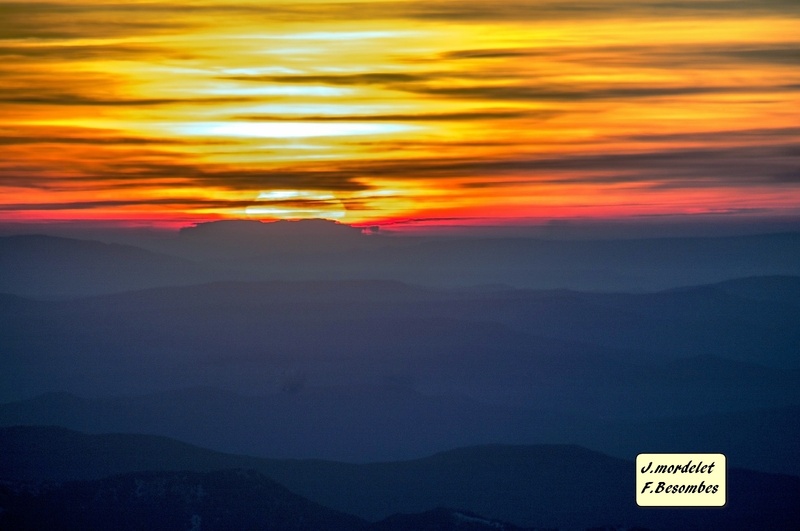 Image in the instant when the sun was over the Canigou. During the ascension. The summit of the Puy de la Seche at left, still has 800m for climb. A panoramic image wider at the top. Joseph noted in this picture some peaks closer, prominent and well known of Provence. Recommended click on picture to enlarge. On the other hand, and as I said in the introduction, Joseph has a large collection of other distant pictures taken by himself in the past, as well as astronomical, meteorological and nature photographs. I highly recommend visiting his own gallery to enjoy much more of each. You can see it here!. Merci Joseph pour vos photos! note (1): I refer specifically to well contrasted photography. A more distant, but much more tenuous photograph I made myself 3 days before from the eastern Pyrenees, 430 km to Ecrins, it can be seen at this link. < Previous Cantavieja – Posets / Maladeta | 257 km. Next > Valdemadera – Midi D’Ossau | 184 km.